Prime Minister of Poland Mateusz Morawiecki debated the future of Europe with MEPs and EU Commission Vice-President Valdis Dombrovskis, on Wednesday. “Poland was one of the first countries to give voting rights to women, and we are deeply rooted in the rule of law. We could have been a founding member of the EU, had it not been for the iron curtain. Now as a fully-fledged member, we want to propose a constructive programme, where we respect national identities and every country has a right to set up its legal system in line with its traditions”, said Mr Morawiecki. “The European project needs to be more open, as today’s situation is without precedent, because of all the crises which have accumulated”, continued Mr Morawiecki, listing the migration crisis, Brexit and a Russian hybrid war among them. 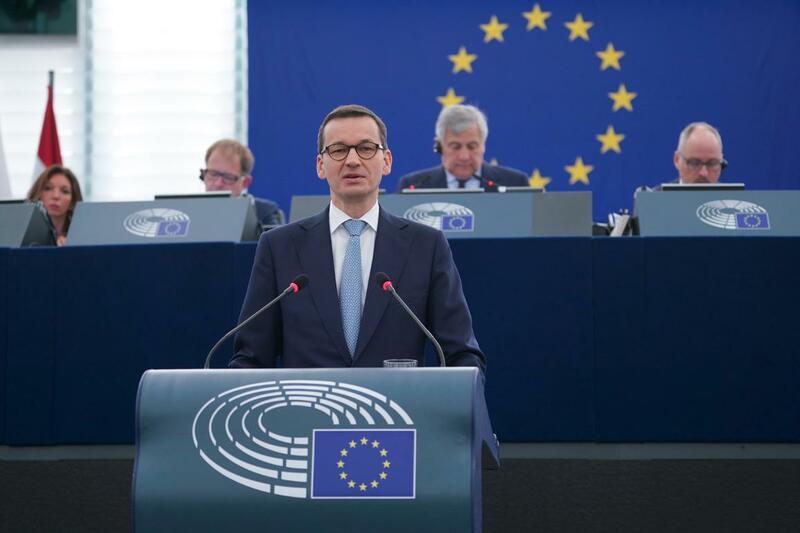 Mr Morawiecki proposed a secure union, protecting citizens against the power of global corporations and fighting disparities with ambitious cohesion policy. He stressed that Poland is closing the loopholes in its tax collection system and tackling tax avoidance and tax evasion, hinting at a passive judiciary, which did not work properly, as a culprit. “We need new competition rules in the EU, adapted for the digital age, to deal with companies such as Google and Facebook”, he continued. The Polish PM also claimed Poland’s allegiance to clean energy transformation efforts and criticised Nordstream 2 as a political project which has led to Russia having too much influence over the Polish economy. “I am happy to see the European defence fund and investment in the defence sector”, said Mr Morawiecki. He also urged the EU to be more realistic in managing migratory flows if it wants to regain its citizens’ trust and offered to double efforts to help finance a development plan for Africa. Throughout his speech, the Polish Prime Minister reiterated that his government supported social justice and eradication of poverty and inequality with bold social policy measures, which ensured public support. Leaders of the main political groups quizzed Mr Morawiecki on the changes in the judicial system, which threaten the rule of law in Poland. Most MEPs condemned the Polish government for consolidating its power. Agreeing with Mr Morawiecki’s stance on development strategy, energy security and defense, MEPs were united in their conviction that the EU must be built on the shared values of rule of law. MEPs recalled that Poland invented the separation of powers in its constitution, which was the first of its kind in Europe, saying that forcing judges to retire and putting them under political control is not a question of a national tradition. They reiterated their support for the Polish citizens protesting on the streets against the changes.